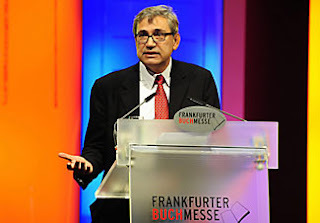 President Gül and Nobel laurate writer Orhan Pamuk met at the International Frankfurt Book Fair Tuesday where Turkey was this year's honorary guest. Pamuk spoke on the increased appearance of literature in non-Western languages, and its potential to bridge cultural divides. Pamuk is a popular figure throughout Europe, and the most famous Turkish citizen next to Hrant Dink to be tried under Article 301, the most infamous section of the Turkish Penal Code posing restrictions on freedom of expression. Pamuk received a minutes-long standing ovation from the largely German audience. President Gül also spoke at the event, as did German Foreign Minister Frank-Walter Steinmeier, who is expected to be Social Democratic Party's candidate against current Chancellor Angela Merkel, a Christian Democrat, in elections to be held next September. Delivering one of the opening speeches of the fair and taking the stage ahead of Turkish President Abdullah Gül, Pamuk said, "The Turkish state's penchant for banning books and punishing writers unfortunately continues." The 2006 Nobel literature prize winner was referring to the infamous Article 301 -- which prohibits insulting Turkishness and state institutions. He said the pressure inflicted on writers in Turkey in the last century has not helped in enhancing Turkish literature, but has led to a deterioration. Pamuk, recalling the process of writing his latest novel, said he could watch films and clips and listen to the songs of the era depicted in the book whenever he needed historical sources while he was writing "Masumiyet Müzesi" (The Museum of Innocence). "But I cannot do this now. Because access to hundreds of … Web sites is banned for the citizens of Turkey due to political reasons. Holders of political power might be happy with these pressures, but when we say promoting our culture worldwide, what we … artists understand from this is not these pressures," Pamuk said.